Let Mrs Pratt be a warning to you, Ms Wintour. TVC attended a premiere of this film which officially opens on May 12. 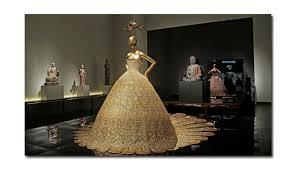 Vogue editor, the infamous Anna Wintour (time to lose the bob, Anna) and Andrew Bolton (director of the Costume Institute of the Metropolitan Museum of Art in New York) plan The Met’s most-attended fashion exhibition – “China: Through the Looking Glass” and the astounding opening party. Is fashion art? On a par with “The September Issue” and “Dior and I“. Fascinating for fashionistas. Not for anyone else. I respectfully agree: this was rather fascinating, albeit a little too long, with some repetition. What irks me about the whole melange though? I’ve no difficulty in conceding haute couture as art, occasionally great art. As for wearing it, forget it, but as Oscar Wilde remarked, all art is quite useless. But when these guys banged on about art, I was thinking about money, power and status. The use of Chinese artefacts to serve as background chinoiserie to the orientalist fashions was an obvious and artless act of exploitation. The documentary picked up on that and didn’t cover it up. The fellow driving the whole exhibition was so clueless, that he kept forgetting to put on his socks before putting on his shoes. It is really hard to know what he was thinking, or if he was thinking. Occasionally, he glanced down at his naked shoes as if to admit he was making-up his abstract piffle as he went. Anna Wintour obviously works hard at the ‘Dragon Lady’ image but she is no Anna May Wong. In fact, one suspects there is no there, there, behind her Chanel sunnies. How come you Adelaide arrivistes manage to see this two weeks before the rest of us? I'm in outroar and uprage! All the same, I totally agree with your review! !